Ankle osteoarthritis is the occurrence of osteoarthritis (OA) in the ankle joint. The ankle joint consists of two synovial joints, namely the talocrural joint and the subtalar joint. In both joints osteoarthritis can be diagnosed in the medial and the lateral compartment. The ankle joint is far less commonly affected by arthritis than other major joints. The reasons for this include differences in articular cartilage, joint motion, and the susceptibility of cartilage to inflammatory mediators. There is relatively good containment and conformity of the ankle joint, the talus is firmly bound on three sides by the fibula, tibial plafond and medial malleolus and their strong ligamentous attachments. This design potentially gives the ankle a better cartilaginous loading profile. The most common cause of end-stage arthritis of the ankle is trauma. Additional causative factors include arthropathies, chronic ankle instability, malalignment, and certain medical conditions, such as hemophilia. Osteoarthritis of the ankle can occur in the joints of the Ankle, the main two being the Talocrural (True ankle joint) and Subtalar joints . There is also a third ankle joint the Inferior Tibiofibular joint which does contribute to movemet at the ankle but much less than its' counterparts, subsequently will be less of a focus. Whenever considering anatomy of a particular joint it is essential to cast your eye and factor in influences from the joints above and below your particular joint in focus, in this case the Knee and Foot, especially as it has been shown that differences in foot and knee characteristics influences rates of osteoarthritis. As a quick consideration, think about the 28 bones and 30 joints of the foot, the some 100 ligaments and the influence all of these have on biomechanics, balance and gait and the subsequent impage on the Talocrural and Subtalar joints. The ankle joint is a synovial hinge joint comprised of hyaline covered articular surfaces of the talus, the tibia as well as the fibula, allowing up to 20 degrees dorsiflexion and 50 degress plantarflexion. The distal ends of the tibia and fibula are held together firmly by ligaments of the medial (Deltoid) and lateral ligament complexes of the ankle which can be damaged and contribute to ankle arthritis (Ankle Sprain). 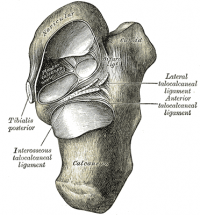 The ligaments hold the tibia and fibula into a deep bracket-like shape in which the talus sits. The articular part of the talus looks like a cylinder and fits snugly into the bracket provided by the syndemosis of the tibia and fibula, when looking down upon the talus the articular surface is wider anteriorly than posteriorly. Subsequently this increases the congruent, stable nature of this joint when it is in dorsiflexion. As this is a synovial joint, a membrane is present as well as a fibrous membrane providing the same functions as any other synovial joint synovial membrane. The muscles acting on the foot and ankle may not be directly involved in the basic pathological understanding of osteoarthritis of the ankle however it can contribute in a more compex etiology, but it is essential to provide targeted, specific rehabilitation of OA ankle. Simply put there are a large amount of muscles acting upon these joints and they act in a similar way to the wrist and hand, this may aid your application and functional understanding. Here is a unfinished list of some of the major muscles of the lower leg and foot, consider these in your rehabilitation and mechanism of pathology. Idiopathic osteoarthritis is the most common joint disease in the world and estiates are that around 1% of OA occurs in the ankle which is, considering the rates of occurance, relatively rare. OA usually affects middle aged - elderly population bases and is rarer under the age of 40, but not impossible. Causes usually are joint deterioration secondary to inflammatory changes, trama, infection, vasuclar or neurological insults and poor biomechanics. These biomechanical insults could be due to excess joint laxity, obesity, muscle weakness and muscle length all of which physiotherapy can influence and alter making physiotherapy an effective treatment option for consideration. More commonly arthritic ankles are usually secondary to trauma or rheumatoid arthritis. This was confirmed by Saltzman et al, who analysed the different causes of ankle arthritis in the patients who were treated at the University of Iowa Orthopaedic Department by considering current and previous medical history and mechanisms of injury as well as current presentation. Of the 639 cases between 1999-2004, 70% were post-traumatic, 12% where rheumatoid disease related and only 7% were idiopathic osteoarthritis. So it can be considered as a unique occurrence compared to other ankle arthitidies. Compared with results reported for knee and hip, there is a substantially lower rate of primary ankle OA. Although early cartilage degeneration occurs, progression to severe grades of degeneration is not frequently observed . This phenomenon is thought to be caused by the unique anatomic, biomechanical and cartilage characteristics of the ankle. Specifically the ankle has a smaller contact area than the hip or knee in a load-bearing pattern and subsequently pressure distribution is different which explains the differences between joints. There is also a relative higher cartilage resistance in the ankle, which might protect it from degenerative changes leading to primary OA. This higher cartilage resistance in the ankle is due to the fact that the ankle is primarily a rolling joint with congruent surfaces at high load, which allows it to withstand large pressures. Although the ankle cartilage is thinner compared with knee or hip cartilage, it shows higher compressive stiffness and proteoglycan density, lower matrix degradation and less response to catabolic stimulations. So the ankle is not generally a site of primary OA (This occurs only in approximately 7% of all ankle OA cases). This last form can be caused by trauma, metabolic disease, congenital malformations, premature menopause, etc. Sometimes, it can happen that a patient is suffering from secondary osteoarthrits before the age of 40. In most of the cases ankle OA is developed secondary to trauma such as fractures of the malleoli, the tibial plafond, the talus, maybe some varus alignment and also potentially ankle ligament injuries. The mechanism of ligament injuries leading to OA may be twofold: either an acute osteochondral lesion which can occur in severe ankle sprains, or chronic change in ankle mechanics leading to repetitive cartilage degeneration, as in recurrent or chronic instable ankles. Due to the fact that this secondary mechanism is the leading cause of ankle OA, sufferers are usually younger than patients with primary OA. As with osteoarthritis of any joint there are subjective and objective patterns which match the symptoms of osteoarthritis you need to be aware of, below is a table with the most common signs. As with any suspect of joint pathology it is important to differentiate between mechanical and inflammatory pathology. This is especially valid for the ankle as we know the rates of an inflammatory cause of ankle osteoarthritis is higher than primary or secondary onset osteoarthritis. Visual Analogue Scale (VAS) to determine pain of the ankle due to OA. Goniometer to determine the range of motion of the two synovial joints of the ankle. Anti-inflammatory medication to counter periodic inflammation. An intra-articular injection of corticosteroids, a drug that reduces inflammation. An injection of hyaluronic acid in the joint. This viscosupplementation refers to the concept of synovial fluid replacement with intra-articular injections of hyaluronic acid for the relief of pain, associated with OA. cleaning the joint with keyhole surgery: arthroscopy. replacing of the joint: ankle prosthesis. Strength training: muscle strengthening exercises for Gastrocnemius, Soleus, Tibialis Anterior and Peronei (repeated exercises with theraband). Endurance training: exercises to increase aerobic capacity. Run training and cycling are recommended. Mobilizing exercises: range of motion exercises. Exercises including plantarflexion, dorsiflexion, inversion and eversion of the ankle are recommended. Balance and proprioceptive training if there is instability of the ankle joint. Exercises (plantarflexion, dorsiflexion, inversion and eversion of the ankle) with airex cushion and wobble board are recommended. Functional exercises like standing on one leg, walking on various surfaces, sitting down and getting up, getting up from lying position, climbing stairs are also recommended because these exercises include several components simultaneously(Level of evidence 1A) (Level of evidence 4). Hydrotherapy: is recommended in international guidelines. It can be useful in cases where the pain is too severe to exercise on dry land. Some studies suggest that swimming and water exercises (including plantarflexion, dorsiflexion, inversion and eversion of the ankle) are excellent for OA patients. It provides relaxation (in case of a warm bath), a decreased pain level and improved mobility(Level of evidence 1A) (Level of evidence 1A). Passive mobilisation: this includes mobilisations for plantarflexion, dorsiflexion, inversion and eversion of the ankle. It has proved to be effective to eliminate pain and joint immobility. It is only effective in combination with active exercise therapy(Level of evidence 1A). Massage: of the muscles around the ankle. This is not effective for ankle OA. However careful and progressive massage of a pain point can lead to temporary waiver of localized pain(Level of evidence 5) (Level of evidence 1A). Thermotherapy: can be effective to warm up tissues (in case of very stiff joints) before exercise. It is also useful for patients with problems to relax. In case of inflammation of the joint, the application of cold ice packs is designated(Level of evidence 1A). Electrotherapy: has not proved to be effective for ankle OA. It may be considered if there is severe pain and it serves then to support exercise(Level of evidence 5) (Level of evidence 1A). Ultrasound: is not advised in the treatment of ankle OA(Level of evidence 5) (Level of evidence 1A). External support devices: have not proved to be effective for ankle OA. However bracing, taping and shoe inserts may be take away the pain(Level of evidence 1A). ↑ 4.0 4.1 4.2 4.3 Drake, R. Vogl, A. Mitchell, A. Gray's Anatomy for Students. 2nd ed. 2010: 609. Churchill Livingstone: Elsevier: Philadelphia. ↑ 13.0 13.1 Valderrabano V., Horisberger M., Russell I., et al. (2009). Etiology of ankle osteoarthritis. Journal Clin Orthop Relat Res 467: 1800-1806. ↑ Sun S.F., Chou Y.J., Hsu C.W., et al. (2009). Hyaluronic acid as a treatment for ankle osteoarthritis. Curr Rev Musculoskelet Med 2: 78-82. ↑ Conduah A.H., Baker C.L., et al. (2009) Managing joint pain in OA: safety and efficacy of hylan G-F 20. Journal of Pain Research 2: 87-98. ↑ Saltzman C.L., Kadoko R.G., Suh J.S. (2010). Treatment of isolated ankle OA with arthrodesis or the total ankle replacement: a comparison of early outcomes. Clinics in Orthopedic Surgery 2: 1-7.